Home » I'm a NURSE :) » PoSITIVE!!! The Mantoux test (also known as the Mantoux screening test, Tuberculin Sensitivity Test, Pirquet test, or PPD test for Purified Protein Derivative) is a diagnostic tool for tuberculosis.It is given by using a needle and syringe to inject 0.1 ml of 5 tuberculin units of liquid tuberculin between the layers of the skin (intradermally), usually on the forearm. Result is read 48-72 hours after the injection. How is it done? Well, the reaction is an area of induration (swelling that can be felt) around the site of the injection. The diameter of the indurated area is measured across the forearm; erythema (redness) around the indurated area is not measured, because the presence of erythema does not indicate that a person has TB infection. In a negative test, little to no swelling occurs. 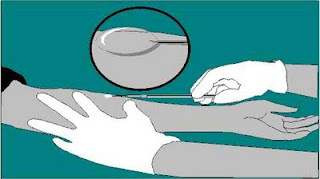 Positive tests cause the appearance of a raised disc which can be between five and 15 millimeters in diameter. If someone has a compromised immune system, a five millimeter reading is considered positive. For more info regarding this, visit this site! Yesterday, I asked my colleague to read whether mine is positive or not. After some rituals, [LOL] he said it's negative! *yay* But my other colleague said he got the measurement wrong so I asked my supervisor to read it again. He said it's positive! Hmmpz. Okay, I'm positive for exposure to Mycobacterium Tuberculosis! However, as a nurse, it is not unusual. When I was a volunteer in a district hospital, I've handled lots of patients who are TB positive. Anyway, what's important is I have normal chest x-ray! I don't get it. Do you have tuberculosis? Sorry I am not a nurse and i am really slow in things like this. enlighten me more.. haha..
whews. i hate ID injections! pinakamasakit! thanks for posting this lily, you know, it has only been a year since i graduated and i feel like i have forgotten everything i learned in college! hey you're positive!!! 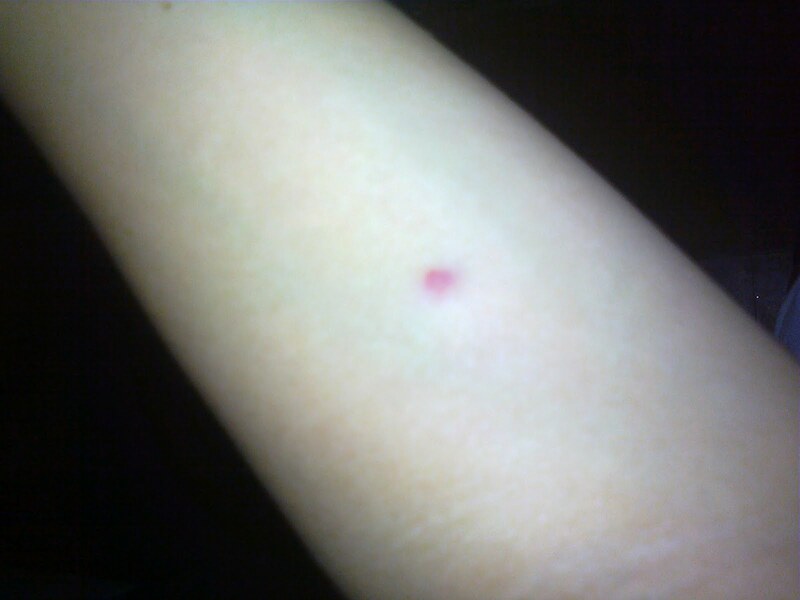 hehe.. ok lang kci di naman confirmatory dx ang mantoux test. i bet if i try this test on myself, magpopositive din ako. i've been exposed kaya sa XDR TB px! huhu.. this is what's so difficult about the medical professions, exposed tayo sa lahat ng infectious diseases. whews. 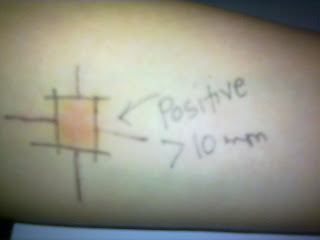 Erythema does not mean you are positive. You are only positive if you have the induration.Go look at pics of a positive and a negative PPD. You do not measure the erythema. The nurse tried to do a test on me on my right arm and said the needle wasn't going in so the wen to my left arm , and did the test properly with little bubble and everything 48 -72 hours later on the test that intentionally took was flat and no redness just little bruise , but on my right arm which was not an intentional test later on that day my are looked like it got bitten by a mosquito bite so what now ?